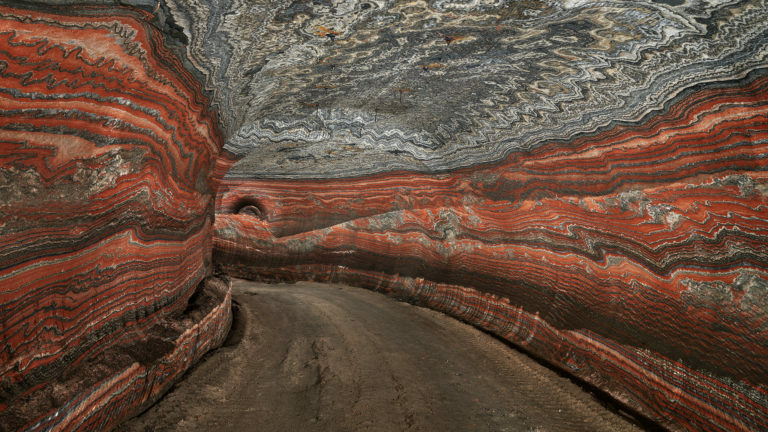 Can art in the form of deposits reproduce the complex systems around us, which act on a global and multi-dimensional level, in the sense of non-conceptual content / Tacit Knowledge? The main focus of my research is currently on the question: How can the deposits of the complex processes of the Anthropocene (Capitalocene) be depicted and made tangible in the form of artistic objects? A recent approach to my research is therefore the combination of concepts that focus on objects at the interfaces of different systems in order to exchange them so that they can be understood or even shown. The connection of the various theories should not be understood as a mixture of them, but each in itself acts like a vector and points to a direction in the virtual space where I position my concept. Common to all is the exchange of different actors, which together form a system. These actors can be objects (inorganic, organic, technical) as well as subjects (cognitive). The only important thing is their connection and the creation of a more by their connection, which is also my focus. At the interface, hyperobjects (Morton, Timothy 2014), boundary objects (Star, Susan Leigh, and James R. Griesemer, 1989) or transitional objects (Winnicott, Donald W. 2006) can be created inter-objectively or intersubjectively. They all have one thing in common: they allow for a kind of forensic conclusions (in the form of deposits) on the actors involved in the system. 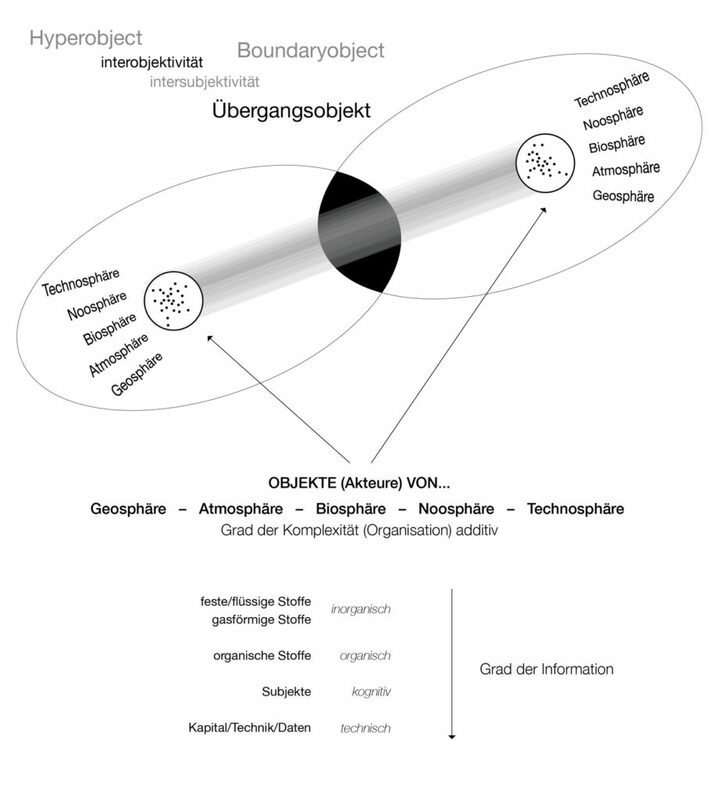 An important factor in their formation is that different natural spheres (bio, geo), with their systemic processes, in connection with the noosphere (human / cognitive) or the technosphere (capital / technology / data) occur. (1) In doing so, new processes are set in motion, the effects of which are reflected in the systems involved and which we can perceive ourselves too well in the ecological crisis itself. For my considerations, therefore, objects come into focus that can make us able to perceive these systemic interfaces. These objects are very similar to those that Winnicott ascribes to infants when they first make sense of themselves and the world. “It [the transitional object] represents a connection between the inner and the outer world of the child and is filled with subjective content.” (2) Replacing “child” with “viewer” in this sentence describes immensely exactly how I imagine an artistic object capable to introduce the non-conceptual content of complex systems. I currently summarize this context with the title “Die Gestalt des Kapitalozäns”. On the one hand I refer to the concept of gestalt, which according to the Encyclopaedia Wikipedia is an “outer shape, the outline, growth or the appearance of persons, sculptures or generally of living things (and their representation), but also [means] their appearance Effect and presence (…)“. So Gestalt does not only stand for the external, but at the same time also for an interior that looks outward. Here, second, the deposit becomes important. Complex systems are difficult to model in their processes, especially in their current state. But they leave forensic traces of their actions (past). These deposits, as I want to understand them, are also found in the complex system of the Capitalocene, which describes the age of the earth, in which capital thrives on the metabolic value added of the ecosystem.The temporal origin can be located in a similar way as it is attributed to the Anthropocene, at the transition from physical to mechanical work, as well as their subdivision into mental and energetic. But this time also marks the beginning of the exploitation of productive forces and material excess, which is settled as deposits in all spheres – e.g. at the material level of dust, scrap, pollution and waste, but these residues can also be used in the form of adjustments, e.g. on the basis of resistance (ie deposits of the age of capital in the gene code of organisms). The special feature here is that these adjustments not only have a direct influence, via feedback, back to the whole system, but can even “overheat” by accelerating it. The reference to the Gaia theory (or Gaia 2.0, Latour, Bruno 2018) is to be understood as a kind of solution approach of a holistic regulation that can counteract the current development (all negative phenomena of the Capitalocene). Thus, the approach comes close to what Matteo Pasquinelli, in the combination of energy and information, describes as carbosilicon machines: “a new political composition of energy and information must be thought against the technical composition that bifurcated them since the industrial age.” (Pasquinelli, Matteo. 2017 ). Personally, I do not envision a mere connection in the sense of merging, but an interwoven system that opposes the machine of cyberfossil capital in the language of Galloway’s Furies, namely in the pure network (Galloway, Alexander). (1) Moore speaks in this context of the binary nature/human which is considered as separate (Anthropocene) and thus distorted the current problem. Capitalism is, according to him, the driving force of this dimension and at the same time an ambivalence is revealed – of course, nature and society are to be considered separately, human thinking and acting in a system with other people is something out of the ordinary, yet at the same time it is conditional to be seen by and embedded in its environment (nature). (2) I found this description on the German Wikipedia page and was immediately absorbed by the wording since it seemed obvious to me that transitional objects would accompany us for a lifetime, e.g. in what works of art mean to us. Galloway, Alexander R., et al. Excommunication: Three Inquiries in Media and Mediation. The University of Chicago Press, 2014. Moore, Jason W. “The Capitalocene, Part I: on the Nature and Origins of Our Ecological Crisis.” The Journal of Peasant Studies, vol. 44, no. 3, 2017, pp. 594–630., doi:10.1080/03066150.2016.1235036. Morton, Timothy. Hyperobjects: Philosophy and Ecology after the End of the World. University of Minnesota Press, 2014. Pasquinelli, Matteo. “The Automaton of the Anthropocene: On Carbosilicon Machines and Cyberfossil Capital.” South Atlantic Quarterly, vol. 116, no. 2, 2017, pp. 311–326., doi:10.1215/00382876-3829423. Star, Susan Leigh, and James R. Griesemer. “Institutional Ecology, `Translations’ and Boundary Objects: Amateurs and Professionals in Berkeley’s Museum of Vertebrate Zoology, 1907-39.” Social Studies of Science, vol. 19, no. 3, 1989, pp. 387–420., doi:10.1177/030631289019003001. Winnicott, Donald W., and Michael Ermann. Vom Spiel Zur Kreativität. Klett-Cotta, 2018.